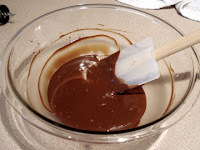 Place the chocolate chips and cream into a glass bowl and microwave until chips are melted. They won’t look melted at first, but when you stir them you see they are melted. Maybe put them in for 2 minutes. When melted add the honey, coffee and brandy and stir until smooth.